The history of our parish is unique. Until 2016, Immaculate Conception and St. Joseph were two separate parishes, two of the oldest in Chicago and each with a rich and vibrant tradition. Today, as on parish united in faith, those traditions continue. We are stronger as a whole and better able to focus on the ministry and mission of Jesus Christ as our parish strives to be a “family of families.” This is truly an exciting and hopeful time for our parish. Immaculate Conception Church, was established in 1859. At that time, there were two other Catholic parishes nearby, Holy Name Church – now the cathedral for the Archdiocese of Chicago – and St. Michael’s in what is now called Old Town. Many North Siders during that era were German, and so were these parishes. Immaculate Conception was set up as the first Catholic Church in the area for English-speaking parishioners, who for the first hundred years of the parish’s history, were primarily Irish. The original church stood on the site of the current parking lot (click to enlarge). In 1871, a catastrophe signaled a decisive pattern in the parish’s life, one of slow and steady comebacks: the Great Chicago Fire burned down the original church, convent and school. On August 9, 1874, Bishop Foley laid the cornerstone of a new brick church that was completed four years later, at a cost of seven thousand dollars. It was a church of bold straight lines, conveying strength and elegance. Its chapel possessed a lovely and dignified scope. A three-story school adjoining the church was added to the north. And a towering steeple was added, surmounted by a statue of the Blessed Virgin Mary. Restoration was complete. In the following years, the parish continued to grow, and became an especially capable sanctuary through World Wars I and II and the Depression. In May of 1953, Cardinal Stritch dedicated a new brick school and convent, the complex that still stands on the site today. Pastor John Fleming in the years before the church's demolition in 1957. (click to enlarge). Long-time members of I.C. say that the biggest event, and most sorrowful experience in the history of the parish was the tearing down of the old church. In 1957, a routine inspection of the church found the roof was on the verge of collapse. This discovery followed on the heels of a tragedy at another Chicago parish, Our Lady of the Angels School, where a roof had collapsed during a fire and ninety-eight people perished. Nobody will ever know how much physical strain the beams of the church at IC could bear. But it might be said that they were not strong enough to bear the burden of anxiety that people had as a result of the Our Lady of the Angels School catastrophe. Archbishop Albert E. Meyer decided that the church had to come down. The lower-level chapel is deeply inviting to the grace of the Holy Spirit (click to enlarge). Fortunately many articles from the church were transferred to a true Godsend of a place – the lower-level auditorium of the school complex which was pressed into service as a chapel. This was to be the church's new home, and Mass is still said in that chapel. The space possesses an austerity which makes it deeply inviting to the grace of the Holy Spirit and the celebration of the Mass. The statue of the Virgin Mary, once knocked down by lightning from its perch atop the steeple of the old church, sits in the foyer of the chapel. The statue stands as a symbol of the struggle for re-adjustment and persistent and enduring faith, which has come to characterize the life of the parish over its history. Rendering of the basilica-style St. Joseph Church as it appeared in 1862 at the corner of Chicago Avenue and Rush Street , and after it was destroyed in the Chicago Fire (click to enlarge). 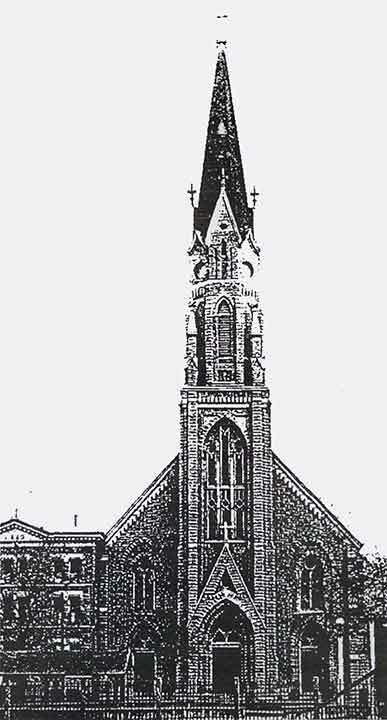 The current St. Joseph Church as it appeared upon completion in 1878 (click to enlarge). The original Gothic style was modernized in 1956. For most of the 1900s, St. Joseph was served by the Benedictine priests of St. Bede Abbey in Peru, Illinois and drew together a wonderful, diverse community of faith. The old school building, directly south of the Church, was built in 1948 and under the leadership of Father Sebastian Lewis, OSB, served the vital mission of educating children from Cabrini-Green and surrounding areas. St. Joseph Church today (click to enlarge). The beloved Fr. Sebastian retired in 2001, and was the last Benedictine priest to serve the parish community. In July of 2001, after years of faithful service that spanned many generations, the Benedictine Fathers completed their ministry and association with St. Joseph Parish and the church became part of the Archdiocese of Chicago. ICSJ Parish: "A Family of Families"
Cardinal Francis George, who envisioned a viable future for St. Joseph parish, transferred the canonical responsibility and pastoral leadership to Rev. Pat Lee, who at the time was also pastor of Immaculate Conception Church. Both parishes, while remaining canonically independent, would be serviced by one Pastoral Staff and together support the parish school, the religious education program and various ministries. In 2015, the two parishes took part in the Archdiocese's Parish Transformation Program. The most important outcome of the Program was the proposal to officially and canonically combine the two parishes in July 2016, thus assuring the long-term viability of two historic churches. Today, Immaculate Conception and St. Joseph Parish is blessed with many faithful parishioners who are committed, dedicated and united in making this “family of families” a spiritual home where our doors are always open and the call to walk with other in faith is constant. The symbol in our logo is a rendering of the Holy Family in which Joseph cradles Mary and the infant Jesus in his arms (see diagram below). The mark elegantly embodies not only the essence of St. Joseph and Immaculate Conception, but the cornerstone of the Parish and School community – our families.